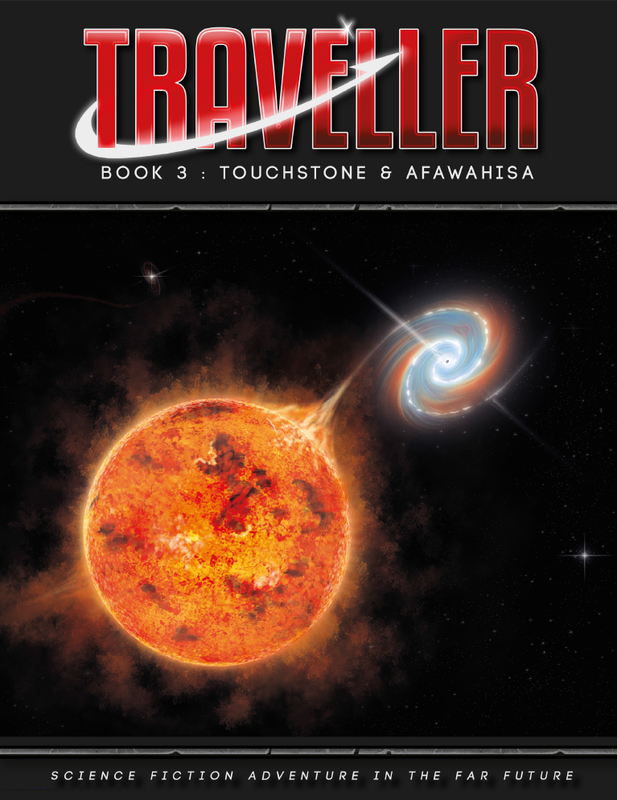 The Great Rift: Touchstone and Afawahisa. Martin J. Dougherty. Note: The reviewer received his copy as part of the deliverable for the Great Rift Kickstarter, and will be receiving the softcover when it ships to Kickstarter backers. One of the stretch goals in the Great Rift kickstarter was some additional sectors—these two. Obviously, that stretch goal was met. The two sectors, Touchstone and Afawahisa, are heavily influenced (and colonized) by the Aslan, as Touchstone lies immediately spinward of Riftspan Reaches (the sector on which the Aslan J-5 trans-rift route centers), and Afawahisa lies immediately rimward of Touchstone. This volume, the third in the Great Rift set, looks at both. There is no introductory material for the volume as a whole; what you are getting is a pure atlas-and-gazetteer, much like the bulk of the two previous volumes in the set. Touchstone is presented first. Its overview page notes the slow colonization by the Aslan, and minimal exploration by humans, but also notes that human names for the subsectors (and for the sector itself) have been assigned, and are used by humans in preference to the Aslan names. Each subsector is presented in order, starting with a listing of the worlds (UWPs in a table), followed by a map, and closed with descriptive text giving an overview of the social, economic, and/or political situation in the subsector, followed by overviews of worlds deemed significant in some way. As with the previous books, there are “callouts” of animals, vehicles, equipment, etc., plus artwork that, while clearly renderart, is nevertheless appropriately atmospheric for the volume. The section on Afawahisa follows the same pattern as that of Touchstone. While Touchstone had at least one system in each of its subsectors, Afawahisa has two void subsectors. Afawahisa also straddles the rimward edge of the Rift, and has a good number of systems lying within the Hierate proper in the rimward third of the sector. Overall, I would judge Afawahisa to be less interesting than Touchstone, even discounting Phobetor. In any case, a worthy add-on to the Great Rift and Reft Sector books, but if you don’t have the others, its value may be questionable.